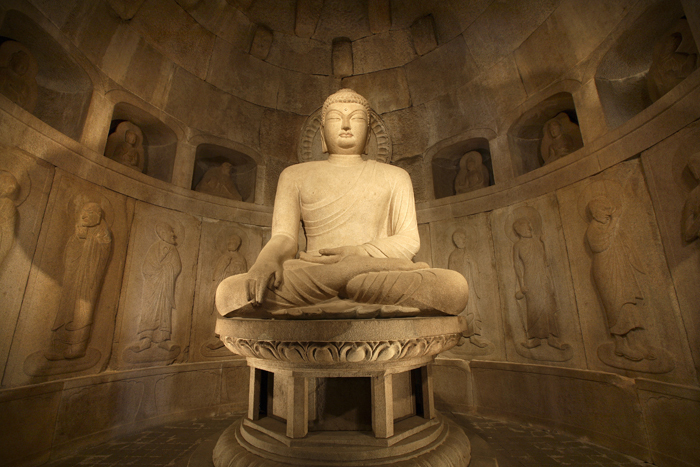 One of the most exquisite pieces of Buddhist art in the world lies tucked away in the Mountains near Bulguksa Temple, Gyeongju, S.Korea. Seokguram Grotto is technically recognized as being part of the Bulguksa Temple complex even though it is situated over two miles away. It is well worth a visit, especially in the Fall when the leaves begin to turn all colors. To reach the grotto we walked along a wide path with many amazing views to the valley below. At just under half a mile from the parking area it was a pleasant stroll on a colorful Fall day. Seokguram Grotto was built between 751-774 CE, the same time as Bulguksa Temple, and employed the best artisans of the Kingdom of Silla. Instead of a grotto built into the mountainside like many of those in India and China the Silla builders chose to build an artificial grotto and then cover it with earth. This was because the local mountains are made from a hard granite which would have made excavating very difficult. The grotto itself was a work of art. There have been water leaks and high humidity level problems for a long time, and each time they have been ‘fixed’ they have created more problems. Over time various repairs and restorations were made, but no one truly understood the engineering marvel it was until the Japanese, under colonial rule, decided to take it apart to clean it and couldn’t put it back together in the original way. They had pieces left over! Nowadays the latest attempt to save the wonderful carvings and statues within the grotto is a glass wall, allowing tourists to see everything but blocking them from going inside. There are about 40 different figures lining the walls, which represent Buddhist teachings. These are mostly carved in bas-relief and unfortunately some have suffered from weathering over the years. All display different features. The main statue is almost 12 feet tall and sits facing the East Sea and the rising sun. He is beautifully carved and even behind the glass wall you can feel the peace and serenity surrounding him. The grotto is a true testament to the artistry of the Silla Kingdom. There wasn’t a lot of signage in English, but fortunately a Korean friend went with us and helped with explanations, otherwise most guidebooks from the area will give you at least rudimentary information. You may also like Hwaseong Fortress: In Photos, Day Trip To Jeonju, and Hwacha: A Korean ‘Rocket Arrow’ Launcher. Please to not copy or use without permission and accreditation. All photo credits to original owners. Photo 2 to Yonhap News. Photo 7 to Images of Korea via http://www.kccro.ro/en/seokguram-grotto, All other photos to Elizabeth Marzec. ← Kpopjacketlady: Adventures in Alaska, Chasing The Northern Lights.